What is Prominent Ear Aesthetics with Thread? The problem of Prominent Ear is caused by the curvature of the ears perpendicular to the skull with the anatomically different position of the ears.This deformity, which affects facial beauty aesthetically, also causes harm on self-confidence due to mockery especially in childhood. Our patients, who suffer from various Prominent Ear problems, complain about not being able to tie their hair as they wish, not being able to shape their hair as they want, and even not using a hat. They can easily remove this deformity with Prominent Ear Aesthetics with Thread.Prominent Ear Aesthetics with Thread is an operation with no laceration that can be applied on patients with an external gap at ear lobe as an alternative to classic autoplasty.Prominent Ear Aesthetics with Thread is a method developed by our Founder Op. 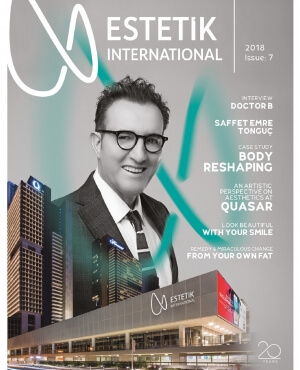 Dr. Bulent Cihantimur,and it has been applied in Estetik International clinics since As medical threads are used to pull the ear lug to the proper position, it is called Prominent Ear Aesthetics with Thread. Who can have Prominent Ear Aesthetics with Thread? Prominent Ear Aesthetics with Thread can be applied to persons with symmetry problems on their ear, those with gaps in ear lube, those who do not want to face the possible risks of surgeries and those who do not wish any general anesthesia and mark of laceration. As the ears complete their development at the age of 6, we recommend the children to have Prominent Ear Aesthetics with Thread by the age of 6 in order to support their psycho-social development.In addition, as Prominent Ear Aesthetics with Thread is an intervention made to the outer area of ear, no problem will be experienced in relation with hearing. • There is no laceration since the threads are placed with the help of the needle. • Patient can instantly engage in social life. How is Prominent Ear Aesthetics with Thread examination made? The gap between and symmetry of the ears are checked in the a Prominent Ear Aesthetics with Thread examination.Depending on the joint decision of the patient and the surgeon, general or local anesthesia will be decided. Prominent Ear Aesthetics with Thread can be applied to persons with symmetry problems on their ear, those with gaps in ear lube, those who do not want to face the possible risks of surgeries and those who do not wish any general anesthesia and mark of laceration.As the ears complete their development at the age of 6, we recommend the children to have Prominent Ear Aesthetics with Thread by the age of 6 in order to support their psycho-social development.In addition, as Prominent Ear Aesthetics with Thread is an intervention made to the outer area of ear, no problem will be experienced in relation with hearing. How is Prominent Ear Aesthetics with Thread made? Prominent Ear Aesthetics with Thread application begins with the ed anesthesia.The medical thread placed by a needle is pulled from the upper cartilage tissue of ear and a proper angle is given to ear.The same operation is performed on the other ear and the places where the needle is inserted are covered with small bands.Patient can control the angle on his/her ear during and after the process. The patient undergoes an extremely comfortable healing process after the Prominent Ear Aesthetics with Thread.After the procedure is completed, a hair band is placed on the patient's head and the patient is discharged.The patient can engage to social life instantly and it is recommended to protect his or her ear from possible impacts for a couple of days. Will there be opening after Prominent Ear Aesthetics with Thread? Prominent Ear Aesthetics with Thread, which is developed by our founder Op. Dr. Bülent Cihantimur,,is an effective technique for correcting prominent ear deformities of thousands of patients and we have obtained very good results sinceThe problem of opening was seen in only 1 % of our patients and it was determined that this was caused by some impacts immediately after the surgery.The procedure can be repeated easily with revision treatments. What does it mean to have Prominent Ear, who is considered as having prominent ear? Prominent Ear Aesthetics with Thread is an aesthetical operation made by threads to the prominent structure of the ear, painless and applied in a short period of time. Is the degree of difficulty different from other prominent ear operations? As it does not carry the potential risks of a surgical application, it is easier to apply and it is a more comfortable application in terms of the patient as it is applied without laceration. Is there an age limit or age-related problems in Prominent Ear Aesthetics with Thread? The development of ears is completed at the age of 4.Therefore, you can have Prominent Ear Aesthetics with Thread anytime after age 4. Can children also have this operation? The application of Prominent Ear Aesthetics with Thread between the ages of 4 and 6 strengthens the child's self-confidence.It can be taken as a measure against the possibility of mockery by schoolmates and the possibility of knowing their own body and obeying their differences at the age of observing their differences. Rather than rasping the patient's ear cartilage and cutting and interfering from the back of the ear, it is done by moving the wrong angle through the thin threads and needles to the skull.This process, which is applied with pointed inlets, does not create any marks or wounds, and is used for medical purposes without any harmful effects.In this way, we can say that it is a kind of fixation by thread, and the wide angle problem in the ears, the prominent ear deformity disappears. Which season is more suitable for Prominent Ear Aesthetics with Thread? It does not pose any seasonal problems, Prominent Ear Aesthetics with Thread can be applied in any season. Patient can instantly engage in social life after the operation.It is recommended that you protect this region for possible external factors for only a few days. No, no dressing is done, it is recommended to wear a hair band for just a few days. What are the advantages of Prominent Ear Aesthetics with Thread? It is easy to apply, the recovery time is very fast, it is stitched, there is no bleeding, no cut marks. Is it a permanent operation and is there a risk of opening ears? As with any surgical intervention, potential risks and effects can be expected in Prominent Ear Aesthetics with Thread.The risk of opening in the ears has the same statistical ratios as the classic prominent ear operations. What are the prohibitons after Prominent Ear Aesthetics with Thread? There is no prohibition, it is recommended that you wear a hair band for a few days after the operation. The level of pain is minimal, according to the feedback from our patients, who had Prominent Ear Aesthetics with Thread.As there is no laceration, there is no tissue pain. It lasts approximately 15-20 minutes.Some of our patients only had 9-10 minutes of applications. It is a process which is mostly done under local anesthesia.